Gold elected a Monthly Bearish Reversal today at 1155. We have some support down at the 1042 level for now. Technical support for August lies at the 1029 level. We will be issuing the update on gold for those who purchased last year’s report by the end of the month to cover the downside. This will cover gold moving into the low updating the weekly Arrays. The long-term forecasting provided in last year’s report has not changed. Everything is in line for the low to form on the Benchmarks. Personal opinion may change as it always does since we are only human. But the numbers and time are unyielding. Either both are reached or we wait. In this respect, the computer is far better than even I could hope to be personally. Gold had 3 primary PATTERNS it could have taken following a 13 year high which were separate and distinct from PRICE. The first is the reaction phase which comes in either 2 or 3 units. If this were to have elected a Yearly Bearish we have at $681, then it becomes a Waterfall Event moving to a change in trend. That does not appear to be likely long-term. That is what the Dow Did from 1929 high electing it first Yearly Bearish Reversal in 1930 which resulted in the bottom by July 1932 within the 3 year reaction time frame. Of course we have the typical people who just fight the trend and are desperate to try to prove me wrong on something so they can declare gold will not decline and they will be right no matter how wrong they have been to date. These are the typical fools who will be wiped out since they are always separated from their money rather easily. Opinions as always mean nothing for even in law it is distinguished as a comment in passing known as “dictum”. For something to be “law” the Supreme Court must expressly state the principle, not merely mention something in passing. So no matter what field we talk about, opinion is not worth a grain of salt. My personal opinion is never a forecast – only the computer can do that – not me. We must always play it by the numbers and time. Nothing else matters at the end of the day. Clearly, gold is not in such a Waterfall Event no matter how bearish everyone gets. We have moved beyond the 3 year window from 2011 and the Yearly Bearish Reversal at $681 has held. To make that final low in gold, the vast majority have to write off gold entirely and regard it as the WSJ just did – nothing more than a “pet rock”. So as the bearishness builds, this is good for establishing character separating the traders from the fools who just believe propaganda and trade fundamentally. But the hate mails still come in and this warns the tree must still be shaken. When they stop, then the market will be ready to rebound but only on short-covering – not new longs. So expect no sudden news of a huge buyer to save the day. That will NEVER happen. The low is made by massive shorts just as highs are made by fools rushing in an believe the propaganda of the promoters at the top. For those who just hate whatever I write, stop reading this blog. Just keep buying for that is your destiny in this life. Perhaps you need to learn a bitter lesson – it’s not fiat, inflation, paper gold, or Fort Knox. Please just read those who preach what you want to hear how the world is wrong and you are the only victim. So far, we are still dealing with a reaction only phase. That could have produced a low as soon as 2013 with a rally into 2015.75, but that would have required also a Phase Transition in the equities, which did not materialize. It would have also required a premature peak in government (low in interest rates), which Larry Summers assured us would not happen by justifying negative interest rates. A 3 year reaction would have been a low in 2014. We just proved that pattern wrong as well making new lows here in 2015. This is a bear market so we have to do some damage. The PRICE objective of breaking $1,000 was not met within that 3 year window so we must look to the Benchmarks as laid out in the International Precious Metals Report. Gold has not bottomed as of yet for it must line up with everything else. The sell signal at the end of July was yet another confirmation that new lows still lie ahead. The Phase Transition in the Dow was postponed for the post-2015.75 era because this target is manifesting as the peak in government – not the private sector assets. Therefore, we should see the low in short-term rates with this target with the last rush into Flight to Quality. This postponement in the Dow likewise secured the decline in gold would be protracted rather than the typical 2 year correction with the low in 2013 or even a 3 year reaction low in 2014. Those targets for the low in gold are in the International Precious Metals Report that warns of the final decline. We are NOT looking for the low in gold to be on October 1 either. If that materialized, it would be extremely profound. However, the more likely event will be the rush to cash completing the final Flight to Quality. How high gold will rise from a major low depends upon the entire political landscape but more importantly, the technical projections and the Reversals generated from that low. Will we still have a free market for gold? Or will gold move entirely underground, deemed the money of “terrorists” in an attempt to hunt down business conducted off the grid? This we will cover for the future rally in the next Special Report. Those who have projected hyperinflation have no sense of history nor of what they even forecast. ALL tangible assets rose in such events – not exclusively gold. When gold rises, other assets will rise as well. Even in a hyperinflation, all assets make that transition to the new land of currencies. 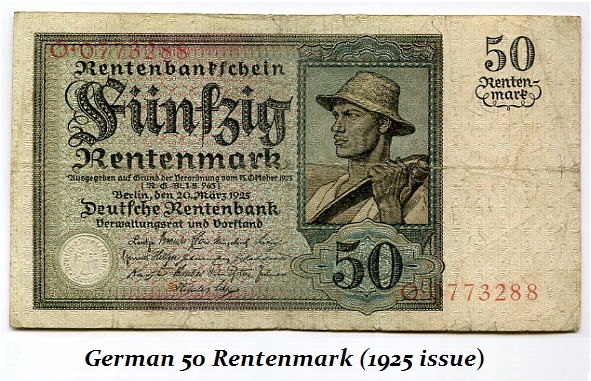 The German Rentenmark that replaced the hyperinflation currency was backed by real estate instead of gold. So do not listen to the gold promoters as they speak with forked-tongue. Sure, gold will rise, but so will equities and in the end real estate, although the latter will greatly depend upon taxation. All things will be redenominated in whatever currency we end up using. The dollar is NOT the problem. The entire system based upon the same structure of perpetual debt is the problem. For now, the Greenback is moving higher. With a rate hike by the Fed, we should start to see panic buying as all the dollar denominated debt will take a hit forcing short-covering in the dollar.